At Cary Car Care, we’ve had the privilege of serving the Cary community since 1990. We provide full service automotive repair for all vehicle makes and models, so you can bring all of your family cars to our shop for service. As a family owned and operated business, we treat all of our customers like family and each car as if it were our own. Every service we provide is centered around our core values of communication, trust, relationships, service and community. We know that there are a lot of Cary auto repair shops to choose from, and our team’s dedication to excellent service is what has kept our clients coming back to us for over 25 years. 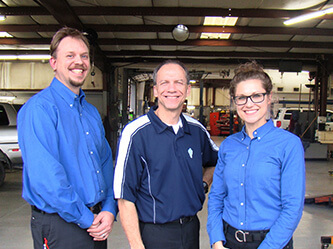 As an ASE Blue Seal Certified shop, you can expect only the best from our team. Our skilled mechanics have the diagnostic tools and experience to solve your particular car problem for good. We specialize in an array of automotive services including, but not limited to, check engine light diagnostics, timing belt replacement, routine brake service, and more. In fact, every auto repair and maintenance service is backed by our leading 2 year/24,000 mile warranty on most parts and labor. We pride ourselves on going above and beyond to provide you the best service possible, including only using OEM and high quality parts. When you come to Cary Car Care, it’s not just about today’s repair or maintenance, but it’s about the overall life of your vehicle. We will explore your vehicle’s complete history and create maintenance schedules to keep your vehicle running for as long as possible. A vehicle repair is usually not something for which drivers plan or prepare, so our team works to provide you with a hassle-free experience. We understand that your budget is usually a consideration with any purchase, so our Cary auto repair team will work with you to prioritize the services you need now, and let you know what services can wait. If you choose to wait while we service your car, we offer a cozy waiting area with free Wifi for your convenience. If you are looking for the best automotive repair shop in Cary, come see why our clients have chosen Cary Car Care for over 25 years!